The Columns of Rome. An elegant double open curved staircase to admire. The Columns of Rome double open curved staircase is the essence of traditional beauty! In the heart of Rome, Georgia, this classic home built in 1910 has gone through a complete renovation. A curved staircase makes a statement in your home, it is the focal point seen by visitors providing visual appeal while representing a fundamental element of architectural design. Making that statement requires quality curved stair craftsmanship, both beautiful and complex. At Southern Staircase our talented team of craftsman has done just that at The Columns of Rome, adding both aesthetic quality and invested value to the home. The double open curved staircase design is a true complement to the reception hall of the home. Set amidst the beauty of a glowing glass chandelier, the staircase adds to the monumental focal point of the home’s elegance. This exquisite double open curved staircase design accentuates the original charm of the home, bringing the client’s vision to reality from inspiration to installation. This winding staircase was inspired by the Nathanial Russel House in Charleston, South Carolina. 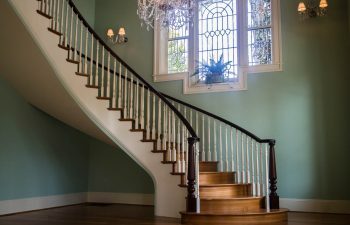 To incorporate the elliptical Georgian design in this luxury home renovation, the original straight staircase was removed while opening up the second floor balcony. Elegance of this 105 year old home has truly been restored. Our industry leading design team at Southern Staircase successfully brought the client’s vision to reality. This luxurious design is built with premium woods manufactured in our state-of-the-art facility complete with finished treads, risers and skirt boards. Antique heart pine treads complement the elegantly restored antique heart pine hardwood flooring. Mahogany Belle Meade newel posts accentuate the starting tread of the curved staircase, capped with custom fittings. Mahogany Hampton newel posts complement the balcony handrail. Hampton pin-top balusters installed on the curves and balcony with care for a luxurious clean look. Elegant Georgian handrail profile used throughout, also in the rich mahogany wood, stained to perfection. With flawless execution our turn key process was utilized for the stair carriage and handrail system installation, guaranteed to withstand the test of time. With an additional stair needed for access to the home’s family living area, Southern Staircase installed a complementing handrail system on the attic straight stair with classic Hampton newel posts and balusters, highlighted with mahogany Georgian handrail. Visit our curved staircase gallery for additional details and pictures on our monumental projects. From inspiration to installation our team is committed to designing and building the highest quality curved staircases. Our reputation speaks for itself and client satisfaction is our highest priority. Contact us today to discuss your next custom curved stairs project. Visit thecolumnsofrome.com for the full photographic experience of this breathtaking colonial home. Southern Staircase is honored to have been a part of this high-end, gorgeous renovation project.